Job searching is an act of looking for employment with the current better position. The immediate goal of a job seeker is to learn about your career aims. Make sure that you are sincerely and interested in the job. Having a job is motivated a person to fits in his career goals. The individuals are doing efforts to avail the best opportunity in any profession. Everyone needed a job; there will be many jobs as there are people. In special circumstance, people find jobs in the various professions like hospitals, schools, different companies, industry etc. When a job is advertised, there are often multiple people applying for the job. They allow a person for better access to facilitate and improve their whole life circle. 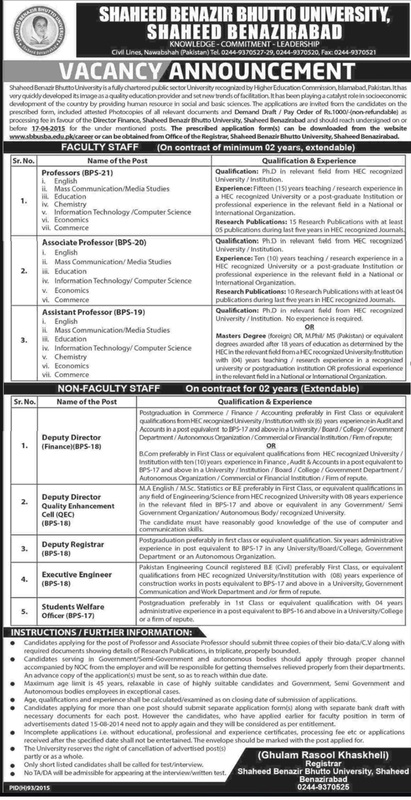 Here, are some inspiring jobs opportunities have been announced in Shaheed Benazir Bhutto University. Shaheed Benazir Bhutto University is a well known public degree -awarding institution in Nawabshah. Sindh, Pakistan. This university is ongoing to boost up literacy rate. It is affiliated with the Higher Education Commission. This women university helps to transfer the good quality of education and enabling individuals to meet employee’s needs. This university has offered many seats for various posts. All job details are given below. 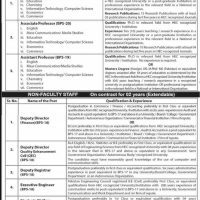 Qualified candidates will apply for any post, you should submit your application to the registrar office of Shaheed Benazir Bhutto university before 08-10-2018. Application submitted after the due date or incomplete will not be entertained. If you are applying for one post then you have to submit a fee of RS/1000 which is a non-refundable fee. This fee is in the favor of the Director of finance, Shaheed Benazir Bhutto University. 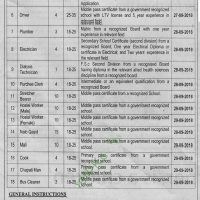 Candidates, who will apply for the professor and Associate professor, have to send application with attested three copies of documents. An application form will be downloading of the official website of the university. In service, the employee will apply through proper channel with NOC and service certificate issued by an employee. Only female candidates will apply for this post. Age limited for jobs is 45 year. 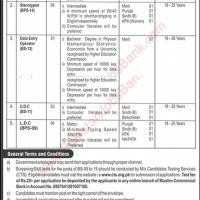 Those candidates who are applying more post then submit separate application along separate bank draft and documents for each post. Candidates will be appointed on the contract basis; initial appointment will be made from time to time. Extension in a contract will be increased as per requirement of the department. No TA/DA will be permissible in appearing test or interview. Do not waste your time come first and avail of this great opportunity, if you want to make a successful career. Best of luck!